Guys I have written an article to support stammering as disability.These are my personal beliefs and and I used somewhere critic language.So ..please dont mind…Next time writing any post I will be more polite. Pls give your valuable replies in Comment box. A section of stutters agrees being branded as disabled as they are able to benefit from it, where as other section do not agree as they do not feel good to get recognized themselves as Disabled. better.This attempt is not for reservations but it is to demand some legislation to stop discrimination in different level. We should raise our voice infront of government to make some legislation and protocol to stop discrimination. A person who has polio in his one leg has given reservation by government .Because He is not able to apply in Army like jobs or in those jobs in which it needs running or walking.If government would not give them reservation then he would be left behind from main stream and it will be violation of human rights too.Even He can do better in jobs like IT ,call center or banks etc still they get reservation.If we consider case of stutters, same conditions are applied to us too..even we get torcherd in so many ways by society that a person with disability other than stuttering wouldn’t.Our case is serious than that of the person affected by polio. Before going to further in this article let us have a look on definition of Disability. I If we consider above definition that stammering can be assumed as Disability. a physical or mental impairment that substantially limits one or more major life activities. Speaking is one such major life activity. Others include seeing and hearing. a record of such an impairment. This applies more to individuals with a history of mental illness. is regarded as having such an impairment. This protects people who are not substantially limited in a major life activity but are perceived to have such a limitation. For example, you may be capable of communicating, but your employer thinks that you can’t communicate. some other Acts in world that consider stuttering as Disability. Australian Disability Discrimination Act 1992 etc. Some views of the people are written below on which I replied. View 1: It depends on individuals Perception or opinion either they consider it as disability or not. Reply : Let us talks about facts not about opinions. 2+2= 3,4 or 5 are opinions but 2+2= 4 is a fact . Any physical or mental impairment or disorder that is INCURABLE and affects our daily routine work partially or completely is considered as disability.We can mention percentage of disability but technically and logically stammering is disability. View 2: I dont think declaring it a disability will change the opinion of the society in any way.Even after declaration of stammering as disability a PWS will be discriminated. Reply : How my friend ? Now a days a company can fire a stammerer giving an excuse that he/she was not capable of doing the given task.we can not even appeal against it.After declaring it as disability government will have to make a legislation about it.After that A PWS can appeal against these type of cases.Although some companies have their own policy to take care of discrimination cases but they are not bound to that and most of these policies are only in black and white. View 3:You said that In so many cases society rejected a stutter as marriage material due his/her stammer. So a girl will marry you if you get a disability status? Reply : look below an opinion poll among stutter attached with well known non-profit organisation The India stammering association (TISA). 71.8% stutters consider stammering as Disability. 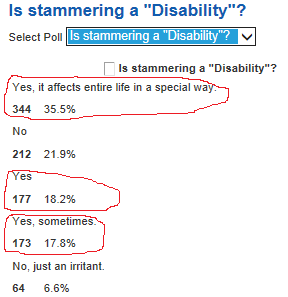 Again look another opinion poll non-stutters.62.32 % normal public ALREADY consider stammering as disability.When a girl marry to a stutter she already know that stammering could not be cured.She know that whom she is going to marry will stammer throughout his life and vise-versa. Conclusion is this people already know that stammering is non-curable so there will be no recognizable effect of declaring stammering as disability. View 4: All u can get from all this is a govt job to be frank,private companies still wouldn’t hire you or promote you,people will still at laugh.I will favour spreading awareness and helping PWS like TISA. 1) All this is neither for personal benefit nor for Reservation.This all to avoid discrimination . It will be our stand in front of government to avoid discrimination.after that it will be up to government how it made legislation about it.If a PWS get a job then it will put him in safe side only.Still awareness will be important because private companies still wouldn’t hire stutters. 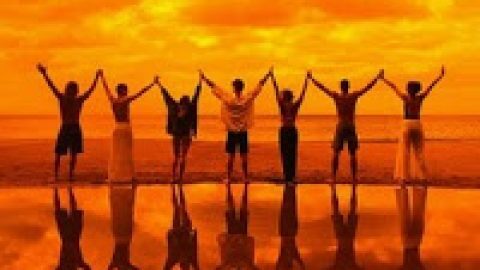 2) We can aware stutters to have better attitude towards problem.We are not living in ideal world.We can’t let ourselves on the conscience of others.We can aware people that a PWS can do better even with his/stutter but it may help only at the time of hiring.Can you tell me how awareness will help a stutter at the time when a company will fire or wouldn’t promote him due to his stutter?? ?.At that time only legislature will work.there are two things one is for stutters to have better attitude about problem and other to avoid discrimination.TISA helps a PWS to have better attitude about the problem but we still need a tool to avoid discrimination. View 5: it is very difficult to predict whether a person stutters really or is faking it. Reply : I think its very easy I have to points to support my statement. 1)Government have to mandate all schools and colleges and schools from nursery to post graduate level that whenever any stutter would leave school or college they have to provide him/her a certificate as a proof about his/her stuttering.Through out his/her studied a stutter will get atleast 3-4 proofs regarding stuttering.Suppose a person want to fake to get benefit of stutters than he/she would have to go to all schools and colleges to get fake proofs,and you know its not possible at all.Even if someone does that certificates can be easly identified because they wouldn’t look like 20 years old. 2)There can be very few people who can mimic stuttering that an stutter failed to recognize.If someone is so good in mimicry than he/she would go to bolywood to become an actor or mimic 🙂 To recognize genuine stutters companies could hire stutters as HR professionals.One other benefit is this it might increase demand of stutters in industry(what could be better than this). 3)In SC/ST/OBC government provide reservation to all candidates .Are all candidates poor or not in mainstream?? ?.To benefit some deserving candidates government give reservation to all candidates belonging to respective category .Also in our judicial system a very famous quote is “ 100 culprits could be freed to save one innocent .“ So the thing is that 100 % transparency is not possible anywhere.We have to think about stutters who are going to be benefited not about intruders. View -6 Government already have burden of reservations . Reply: Please read point no. 3 in view-5 reply.If we deserve we should go through. Reply : That’s it.Almost in all cases a stutter hesitate to accept stammering as disability because he don’t want to be labelled .We stutter take it to our Ego.I already explained in view-3 that people already consider as disabled they already consider stammering non-curable .When a person meet a stutter he never think that one day that stutter will cure himself(some people suggest us that do this or that it will be cured,but actually those are the who are unaware of stuttering) .I suggest we can understand stuttering better than others. Story of a poor man. A poor man in a village never applied for BPL (below poverty line) card because he do not want to be called as “poor”.He never applied for any government scheme for poor people because he thought that it’s better to live in crises than that of being assumed as poor.What do you want to say about that person? ?..different people can have different opinions about it..but thing is that He just pretended to be rich or contented even he was not. Same example is true for some of our fellow PWS.In our TISA group we believe that Stammering is “Incurable” but we can not ACCEPT it as disability although we often discuss on concept of ACCEPTANCE.Even technically and logically stammering is a disability but still we pretend to be alright. View:8 “I see stammering more as a diversity rather than a disability. I am more inclined in seeing stammering as a “transfluency”, the term introduced by Cristobal Loriente, a researcher from Spain, and a pws himself. Transfluency means a speech which is not fluent. It does not identify it as a speech ‘impediment’. Why should we be looking for Sympathy and Pity rather than looking for recognition and opportunities?I feel it’s a step backwards. G Guys give your valuable opinions and suggestions about this issue in comment box. My journey as Bangalore SHG co-ordinator.. If there was legislation, the case would not have gone to court. It could be sorted then and there. Amit- congratulations for a good research and sharing!! I think in a wider perspective this would be helpful in case of moderate to severe stutters. Its sad but its true that in decisive situations of life like job interviews, first impression is the last impression . And stutterers are looked upon as under-confident, or strangely behaved people during interviews. We also need to spread awareness about stuttering to prevent discrimination. Hi Amit firstly thanks for a superbly well researched article. Yes it is often painful to acknowledge that it is a 'disability' but especially for those who have not built that confidence/technical expertise to get job security otherwise, this would be a useful point. And yes, the online english speaking TISA community is not a representation of all stammerers-this was brought out even at the TISA NC held at Delhi earlier in 2013. I agree and open discussion is required . hey amit, it is great that you have put all your beliefs and understanding and have involved many views and given some very new ideas(atleast to me). i havent yet read the whole article but have just gone through it. it would have been much better if the article was better structured and probably broken into parts (like a smaller blog today and further parts in upcoming blogs and so on).. this is because everybody has less time. i will read it by night and give you more inputs and then we can discuss it..
Amit, you got excellent writing skill. Pl nurture it and improve. Regarding my comment on giving disability status,it is more of a individual perceptive. If anyone asks me I will say NO only. The disability status is like a shield. If we got that status, most of the stammerers will hide behind it and won't be motivated enough to control it. Stammering is the worst disability. Through out our life, it will neither allow us to live the way we wanted nor it allows to die. Of course blinds and deafs are more pathetic as they neither see nor hear the beauty of the world. But after sometime, they are able to accept their disabilities as they is no other option and accepting their disability 100% and adopting their life accordingly. But this is not the case for stammerers. For each and every moment, they are always under constant pressure like how to start a conversation without stammering, what word we have to substitute not to stammer etc. yes… we are dying at every moment. We are also not able to accept 100% of our stammering. Because when we practice some technique, we started speaking fairly well and seeing some light. But due to some reason, when we discontinue practicing we are back to square one. Even during regular practicing times, we are having good days and bad days…. a very little option for us. The stammering is really a mysterious and a complex ………. I am unable put exact word in the dotted line no one knows under what category stammering is coming. Is it a disease or disability or neurological or psychological or combination of both…What a confusion. This itself is like stammering. Finally my views on your post is your writing skill is wonderful. And my comment is ….so sorry….NO COMMENTS.. Thanks friends for your valuable comments.Thanks Manimaran sir for ur detailed views.Its true stuttering is something like stuttering itself.Any thing that is difficult to understand could be called as Stuttering 🙂 😉 as a joke.stuttering is something that affects life severely couldn't be left undiscussed and on the willpower of individual. Yes I agree, because of this problem I got rejected in most of the interviews..